ARM announces the Cortex-M0+, a new chip designed for a broad range of applications that require ultra-low power microcontrollers, including home appliances, white goods, medical monitoring, metering, lighting and power and motor control devices. The new processor cores measure just 1mm x 1mm and according to ARM the Cortex-M0+ is the most energy-efficient 32-bit processor in the world, it promises to consume a third less energy than its 8-bit and 16-bit predecessors. 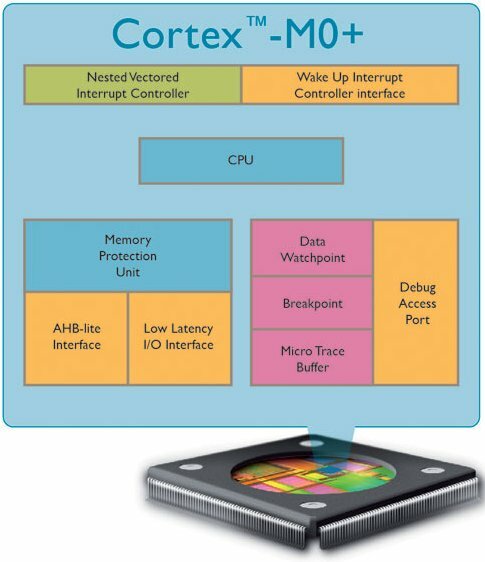 ARM today announced the ARM® Cortex™-M0+ processor, the world's most energy-efficient microprocessor. The Cortex-M0+ processor has been optimized to deliver ultra low-power, low-cost MCUs for intelligent sensors and smart control systems in a broad range of applications including home appliances, white goods, medical monitoring, metering, lighting and power and motor control devices.